Claus Vissing is one of three guests riding for Panthers in Somerset. 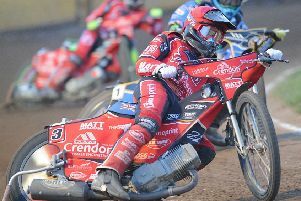 Peterborough Panthers have snapped up a third guest for their Premier League Cup Southern Group trip to Somerset tonight. Argentinian ace Nico Covatti has been drafted into the patched-up side for the visit to the Oaktree Arena (7.30pm) after becoming available this morning. Covatti’s own club, Ipswich, have seen their trip to Plymouth in the same competition postponed meaning he can now deputise for the unavailable Lewis Blackbird for Panthers. And Covatti brings proven course form to the table after piling up 14 points when Ipswich drew at Somerset last week. He becomes the third guest to feature in the Panthers side tonight with the classy Dane Kenneth Hansen slotting in at number one and his countryman Claus Vissing filling the void left by Robert Lambert’s absence for the second successive night. SOMERSET: Josh Grajczonek, Leigh Lanham, Richie Worrall, Charles Wright, Brady Kurtz, Paul Starke, Benji Compton. PANTHERS: Kenneth Hansen (guest), Michael Palm Toft, Claus Vissing (guest), Nico Covatti (guest), Ulrich Ostergaard, Simon Lambert, Ollie Greenwood.